Hey everyone! Last week I posted this on FaceBook and never had time to post this here. I am now back in town and wanted to get this up. I will be getting back on here and Instagram! Traveling across the country tomorrow to visit family and a rugby team golf outing. Prepped my meals because I’m on them poverty macros on rest day and only 6lbs away from my goal weight. Not about to blow it now! 60c/40f/230p. All kinds of egg white cutz! The one on the left is egg whites with strawberry splash and coco loco Milk Splash and Laughing Cow Strawberry Cream cheese and 1tbsp coconut oil with 3 Kim’s mini pops. 13c/22f/34p. Next is crab meat, LC chipotle queso, ff cream cheese, on a bed of spinach. 13c/5f/57p. Next turkey, mushroom, zuchinni, spinach, and queso. 17c/7f/58p. Last is turkey, mushroom, spinach and queso. 13c/3f/56p. Each one is 275g of egg whites. Finishing off the day with a scoop of CnC Cellucor. I know its not the widest variety but making sacrifices to hit that goal. I will have a kitchen at my hotel so as soon as I land first stop is a grocery store. Getting tired of seeing these yet? Not sick of eating them. Today and Friday I made up some regional frittatas. On Friday I did one that was inspired by where I currently live the good ‘ol pacific northwest. I used some local smoked salmon, whipped cream cheese, spinach and mushrooms. I topped it with some Heinz ketchup but really didn’t need to. 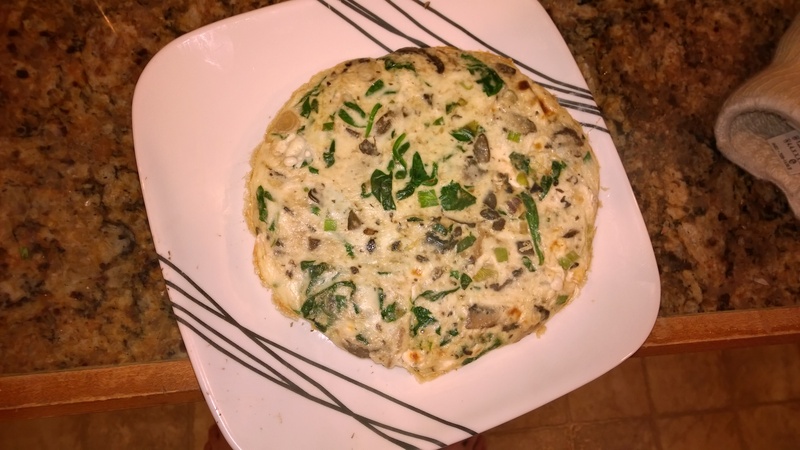 The combination of the salmon and cream cheese has always been a favorite of mine and adding the spinach and mushrooms helped to give it some volume and added some additional flavors, plus helped hit the micro nutrients. This like all of my meals was super easy to make! I took 2oz of the smoked salmon and heated it up in a pan on medium heat then as soon as I weighted out the serving of cream cheese I added that. I weighted out the spinach and the mushrooms and added them to the pan. Once the spinach had wilted a bit I added 1 cup of egg whites. Let the eggs cook a bit around the edges and stirring constantly till it was like an egg soup texture so that you have some cooked egg throughout. Once you have reached this stick it under the broiler for 10 minutes and let it cook the rest of the way through. Once its done plate and enjoy! Macros are great for this meal if your low on carbs and you can use fat free cream cheese to save fats. The other plus is you are getting good fats from the salmon. For the whole thing without the ketchup its 9c/7f/42p. Smoked Salmon, Whipped CreamChee, Spinach and Mushrooms. Topped with some Heinz Ketchup but not needed. This morning I went back to the east coast with a little “crab cake” frittata! 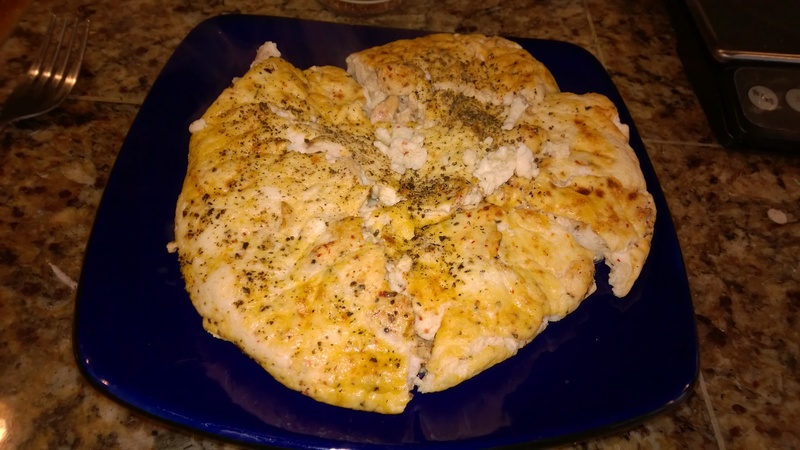 This came out awesome and was helpful on this low carb rest day. I would have preferred to find some fresher crab meat and would have preferred blue crab but what I had was better than dungeness. The other change I would have made was adding Old Bay earlier in the process, but that’s what this is all about making and tweaking! 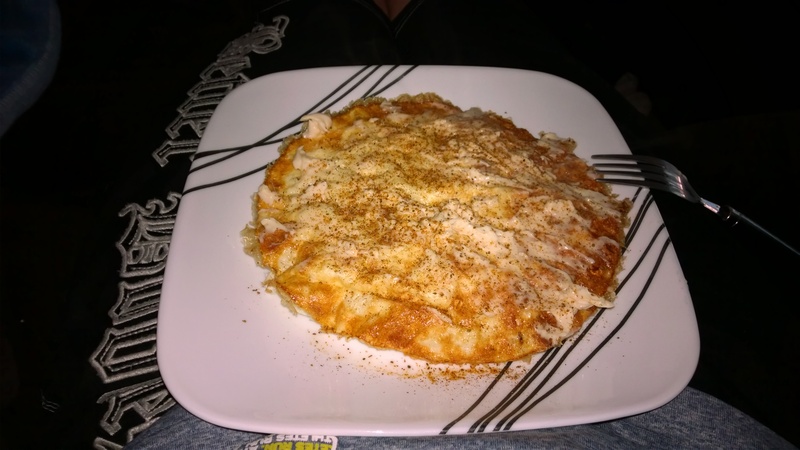 So whats in a “crab cake” frittata and how did I make it? I took 3oz of canned lump crab meat, fat free cream cheese and some Laughing Cow Queso Fresco Chipotle and warmed it up on a medium pan. I added 1 cup of egg whites and followed the same procedure as above, but just before I popped it in the oven I crushed up two Kim’s mini pops and added it to the mix to give it the crunch and that light binder that you would get from a crab cake but still keeping the focus on the crab like they do in Maryland! Once I pulled it out of the oven I spread another wedge of the Laughing Cow and some Old Bay seasoning on top. If you want to take your taste buds on a trip to the east coast for some crab cakes this will definitely accomplish that! The macros for this frittata was 8c/5f/51p and worth every bit of it! I actually had this at 10am and now that it is 1pm I am still not hungry which is very important today when I am running on poverty macros! Give it a try and enjoy! How’s everyone doing today? As I am sure you have seen by reading this by now I have been on a frittata kick lately. They are simple, quick, delicious, easy to fit my macros and the combinations are endless! 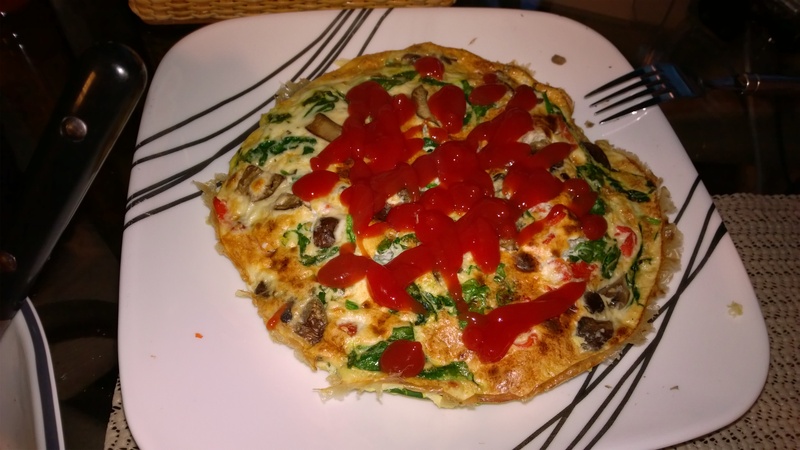 After messing around with some of the savory one I decided that I wanted something sweet on one of my 60 carb days and instead of using up half my carbs on cereal or oats I thought lets try a sweet frittata. I picked up some baby food to try in a few different ways and had some apple baby food and I also picked up some Laughing Cow cinnamon cream cheese which is amazing by the way. I also remember how the one time I did French toast instead of wasting the macros from the egg wash that I made an omelet out of it the remaining eggs that weren’t sucked up into the bread so I would basically make the base of the French toast as the eggs. Turns out this combination came out awesome! Last night I actually bought some small gala apples from Trader Joe’s and since it is a leg day I had some extra carbs to work with so I decided to get a little crunch in this one. I cut up one of the apples the night before except the core which ended up being exactly the serving size I needed and coated it in cinnamon to sit over night. This morning I tossed it in the pan with one pouch of the Laughing Cow cheese and 33g of fat free cream cheese. Once this was mixed up nicely I added 1.5 cups of Lana’s egg whites which I mixed in some cinnamon and 3 Stevia packets to and cooked a bit. Once it cooked just a little and the mixture was still wet I put it under the broiler for 10 minutes. Once it was done I pulled it out and placed it on a plate. I added another Laughing Cow on top and added some WF Pancake to it and it was an amazing breakfast to go with my slow cooker oatmeal that I made with prune baby food (yes I am still using this. 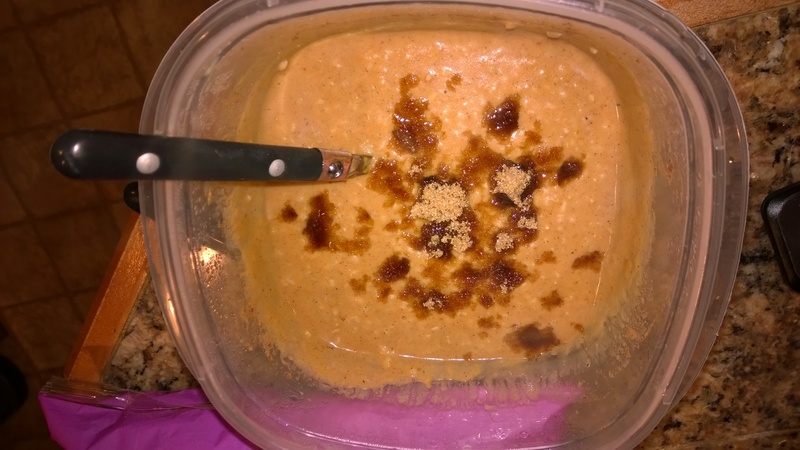 Great macros and easy) and key lime white chocolate graham cracker myoatmeal.com mixture. I seriously thing that I could only eat the crust from the slow cooker oatmeal all day and be happy, but I digress. So here is the recipe and macros for the frittata followed by some pictures. This will be featured in my day of eating I am posting today from Sunday. Sorry the download of the videos took longer than expected. Place cubed apples and cinnamon in pan to heat up the apples. Add in one Laughing Cow Cream Cheese and the fat free cream cheese. Measure out the egg whites and add cinnamon and sweetener to them and mix. Pour the egg whites in the pan with the apples and stir to mix in the melted cheeses. Let cook for a bit constantly stirring the eggs off the pan. Place the pan under the broiler and cook for about 10 minutes until the eggs are fully cooked and slight crust around the edges. Make sure to use an oven mit to pull out the pan as the handle will be extremely hot! Remove the frittata from the pan and place slices of the remaining Laughing Cow on top. Enjoy! The macros for one with baby food, you can also use regular apple sauce but I recommend low or no sugar added, are 18c/8f/47p. Thinking of other ways to change this up, just thought of a chocolate banana one. Let me know any suggestions or if you try it what you think. This would also make a great dessert! Nice apple chunk about to be devoured! Made with a real apple. Here is the frittata made with baby food. Look at how much it puffed up. So much volume! Low and Slow and Wrap It Up! Yesterday I posted about my pumpkin pie oats and I decided last night that I would go with the same thing this morning just change it up a bit by putting it in the crock pot over night. Luckily my crock pot came with something called the little dipper and it was the perfect size to fit this meal in. I followed the same recipe as yesterday just let it cook sloooww over night and when I woke up the next morning I was not disappointed. I previously had only soaked the oats over night in the fridge and this was my first attempt at using the slow cooker to actually warm cook them. I sprayed the cooker with a little coconut oil because reading (yes I actually read something) online about how people would slow cook oats I found a lot were having issues with them sticking to the sides. So after I sprayed the sides I just poured the oats mixture in and put the lid on and let it roll over night! Oats in the crock pot. When I woke up in the morning I was happy to see that one they not only had not boiled over but also were nice and thick! As I stirred it up in the crock pot I could feel I was scraping a crust off the sides. This turned out to be possibly the best part of the entire experience. It was filled with flavor and the texture could not be beat! Once I had them all mixed together I grabbed a bowl and the rubber spatula and got every last bit out, wasn’t leaving anything behind of this tasty treat! I tried to slowly enjoy them, the fact they were actually hot because of them being cooked really helped, but they were so good they didn’t last as long as I would have liked! TRY THIS COOKING METHOD FOR OATS! I know it can be tough if you are trying to just make a single serving because trying to do that in a full size crock pot can be tough. That is actually the reason I hadn’t tried it because I would have had to do like 4 servings and trying to figure that out cooked is not something I had the time to try to figure out. I highly recommend trying to find a small enough pot so that you can cook this way. Tonight I think I am going to try it with my Key Lime myoatmeal.com blend and some banana instead of pumpkin, but tomorrow is another 60 carb day so it would be one serving and I might not be able to get the banana to fit. Pumpkin is lower carb so I might get it to work just wondering how key lime, white chocolate, graham cracker pumpkin oats would be? Hey YOLO right? What a sight to wake up to! Yesterday I got an order from Michel De France with a bunch of their amazing crepes, soy wraps and some thicker soy wraps called Norigami. For my post workout meal I decided that I would give the thicker soy wraps a try heck for 1 carb, 1 fat and 2 protein why not! They were chili flavored and had chili flakes in them which made them even better! 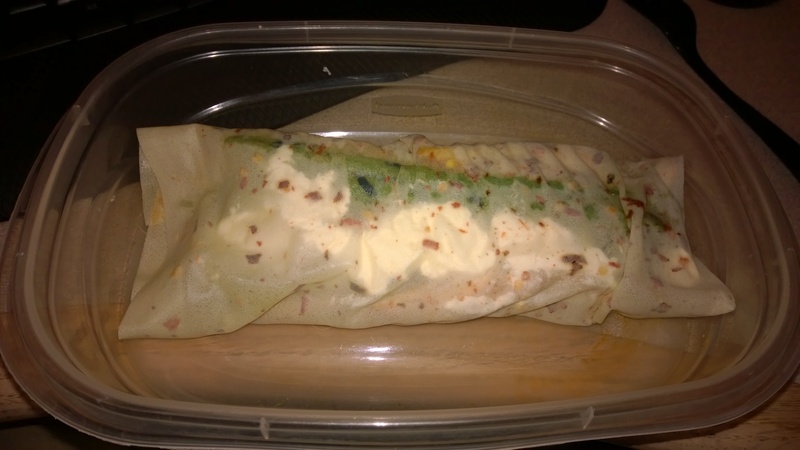 Before hitting my cardio last night I stopped at QFC and picked up some Boar’s Head and one of the meats I got was the chipotle chicken breast so I decided I would use this, some asparagus and FF cream cheese as the filling. So after a monster shoulder and arm day I hopped on the Harley and headed to the office to get work done and hammer down this wrap. One concern I had was how the wrap would hold up since it was a little thin but there were no tears or anything so it passed that test! Next of coarse is one of the most important test and that is how did it taste? Awesome! 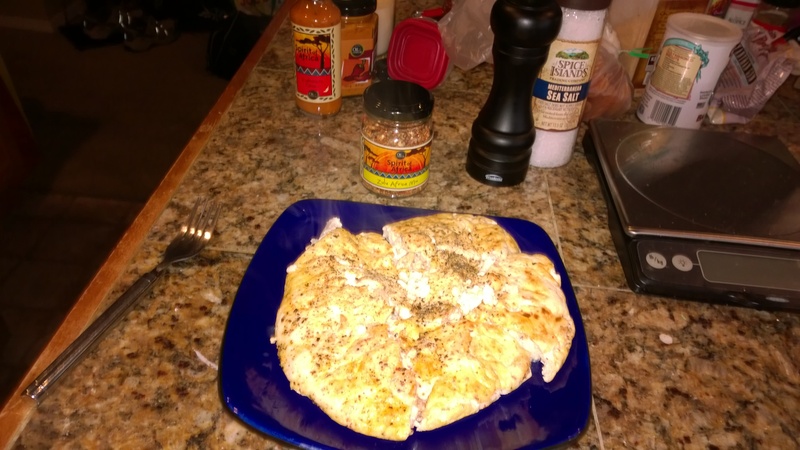 The chili flakes gave it a nice little kick along with the chipotle chicken. The asparagus gave it a little crunch and the cream cheese really balanced the whole thing out. This was a nice quick and filling meal that is holding me over till lunch pretty well. The macros for the whole thing were 7c/3f/33p! Can’t beat those poverty macros. Chicken, asparagus, and ff cream cheese wrap! I am posting this as a menu item but not really sure how that is different. If it doesn’t show up right I’ll post it like normal. It did not post right as a menu item so I am posting it here. This is more of a pre curser to what I am having for breakfast in the morning. I am trying to eat through some of my custom steel cut oatmeal from MyOatmeal.com. I have a White Chocolate, Pumpkin, and Graham Cracker Crust flavored steel cut oats blend. I decided to kick it up a bit. Here is my recipe for my overnight oats tonight and will have some pictures and feedback tomorrow. Place all the ingredients in some Tupperware and stick it in the fridge overnight. Depending on the texture and volume in the morning I may give the double cook a try on these. I also may try these again in a slow cooker depending on how it comes out. I also may top it all off with some brown Splenda and WF pancake, but its all going to depend on what happens in the morning. Excited to get to bed and wake up for this and my frittata! The macros are 61c/7f/12p and can be reduced by doing a single serving of oats. So this ended up coming out amazing! The pumpkin gave it more thickness and I was able to add more water in the morning to give it more volume. I ended up topping it with some Splenda brown sugar and that put it over the top. Definitely a keep of a recipe. Highly recommend you give it a try because it is easy and tastes great! Let me know if you do or if you change it up a bit and how it came out. 80g Myoatmeal.com blend, 61g Pumpkin, 1cup almond milk, pumpkin pie spice and Splenda brown sugar. 1 Blueberry, 1 Strawberry, 2 Pumpkin, and 1 Cinnamon. with an array of dipping yogurts! 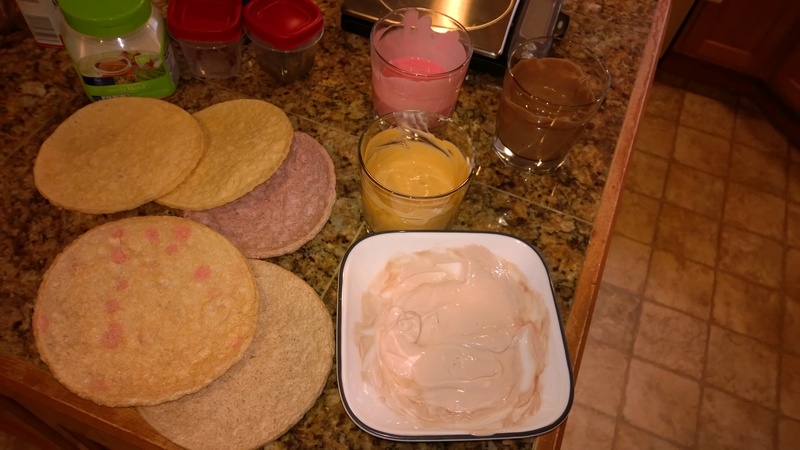 I took 1.5 cups of Fage 2% and mixed a variety of dips for them. In the bowl is some WF blueberry, the gold cup is caramel, the red is strawberry, and the last one is chocolate and Myoatmeal.com custom PBLean. I broke apart the pops and just went to town on the dips! This was awesome the flavor from the Pops and the dips played very well together and I was definitely full after this. There are a bunch of other flavors and they have minis and some chocolate drizzled pops that are great as well, now I just need to find a way to walk past the drizzled without grabbing one! I highly recommend that you give these a try. I ordered two of their samplers and I think I have enough Pops to last me a couple months so you do get a lot out of the packs! You can order them at http://deliceglobal.myshopify.com/ or Amazon sells them as well. As always enjoy! Day of Eating 80 Carbs – Actually 60 Carb! Update: My macros got dropped today to 60 carbs on off days! This just got real! Well I am finally feeling better from my cold that I had and going to start playing catch up both here and on videos. I have a stuffed Poblano recipe video that I will get edited today. I decided that today I am going to do a day of eating for you. It is my rest day and I am only getting 80 carbs. I am going to fill this out as the day goes on to help me get through the day and slow my eating down by typing it up during each meal getting my stomach fuller faster, its a mental game today! Going to be drinking a crap load of tea and water to fill me up. Starting off with breakfast. I have been craving some peanut butter and jelly lately so I was thinking of putting together a PB&J frittata but couldn’t get my concoction to fit into the macros today after I had already put the rest of the day together. I know this goes against IIFYM because you are supposed to be able to make what ever you want fit if you can but I like to plan the day out in advance so that I do screw up and get stuck with like 1 carb no fat and 50 protein at the end of the day. So I ate what I planned and I am not disappointed. I was hoping to find a way to cut the carbs down in the morning but you’ll see why that was tough. So I finally got around to making a new batch of the Sticky Fingers Scones that I bought last trip to World Market. This package was Raspberry White Chocolate and they were amazing. This is why I could not move the carbs I was craving one of these bad boys. You get a good size scone for 27c/3.5f/3p and they are so moist and delicious! Next flavor I have is chocolate chip and I am looking forward to those one I am out of these. I ate this as I was getting the ingredients of my frittata ready. 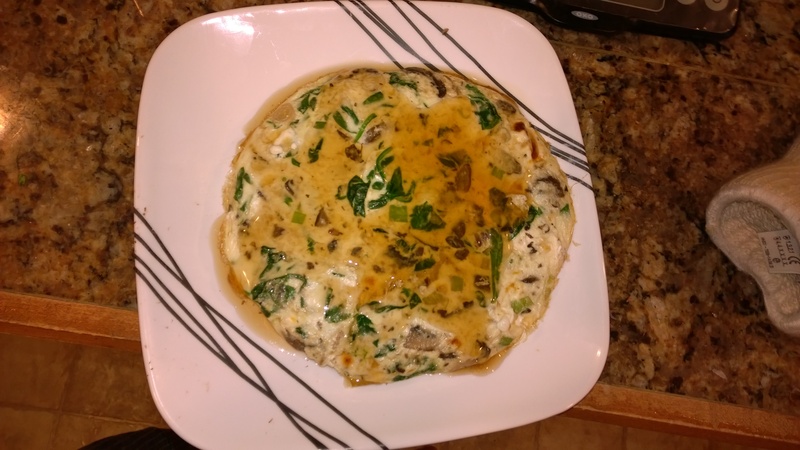 For the frittata I went with spinach, mushroom, green onion and the last time I was at Trader Joe’s I found bacon ends and pieces that were 0c/3f/3p for 7g, not much but with all that fat it really melted the flavor into everything, then mixed in some fat-free and whipped cream cheeses. I am eating this as I type this out and it is amazing! I topped it with a little Walden’s Farms maple syrup to play well with the bacon pieces. As you’ll see as I post other posts through the day to keep me occupied I have been on a frittata kick and have some pretty good combos worked up. So here is the recipe and ingredients of the frittata this morning. Stay tuned for the rest of the day! What I do is heat a pan on medium heat and spray with Pam. Once the pan is warmed up I toss in the bacon to render down some of the fat and get it cooked a bit. I the picked it up with a fork and cut it into small pieces so that I got it throughout the whole frittata. I tossed int he green onions and mushrooms and then once they got a little soft I tossed in the spinach to wilt a bit. Once that looked good I added the cream cheeses and left them melt throughout the mixture. Once that looked to be spread around, its ok to have some not to melted you get these pockets of awesomeness when you are eating and just get a little chunk of cream cheese, I lowered the heat to low-mid heat and added the egg whites to cook just a bit. Once it was like the consistency of an egg soup I placed the whole pan under the broiler and let it cook for 3-4 minutes until it had a nice browned top and the edges were a little crisp. Once this one done I put on the oven mitt, DON’T FORGET THIS YOU WILL BE SORRY, and pull it out. Run your spatula around the sides and it should just slide right out of the pan. There is your breakfast! Bon appetite! Bacon, Mushroom, Spinach, Green Onion, and Cream Cheese Frittata. Bacon, Mushroom, Spinach, Green Onion, and Cream Cheese Frittata. Topped with syrup. So about 10 minutes ago I got my message from my macro coach that things are changing for the week since I didn’t lose anything this past week. So carbs on lifting days got dropped to 155 and on off days all the way down to 60 carbs. Time to put in the tough work and modified todays meal. Unfortunately I read this after I had already made my mid-morning meal of asparagus, butter lettuce, tuna, and a Carb Master yogurt. 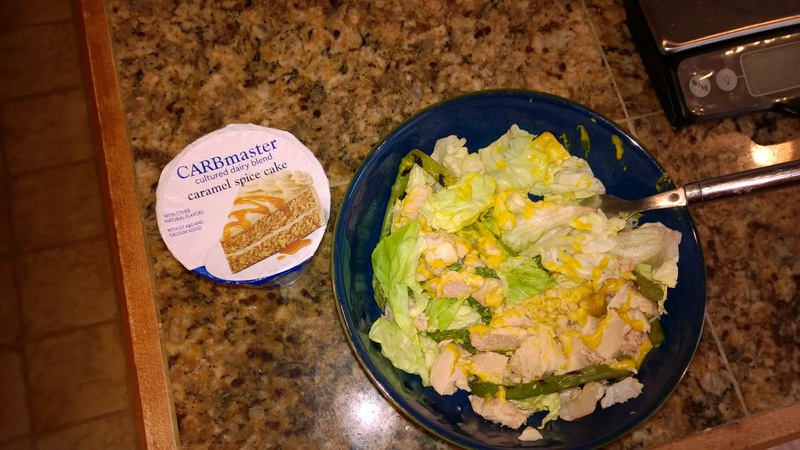 There really isn’t much to say about this meal it was plain and simple just heated up some grilled asparagus and put it on top of the lettuce and then dropped the can of tuna and used some mustard for flavor. For a little sweetness I had a Carb Master Yogurt I found at Fred Meyer but any Krogers will have them. I had a caramel spice cake flavor to kill that sweet tooth. The macros of these are 4c/1.5f/9p which is a God send today to get me through. Time to drink about a gallon of water and tea to fill the stomach. Time to get out of the house for a bit to do something other than think about eating my next meal which is basically tuna and lettuce. Dinner also got changed from stuffer Poblanos to a chicken frittata. See you guys in a couple hours. I will continue to post other recipes and meals today to get caught up. Tuna, asparagus, and butter lettuce salad with a yogurt. After eating my last meal I headed to the mall to pick up some tea and while I was there I also ended up stopping at a store called Oil and Vinegar and picked up some grape seed oil to help me hit my fats now that I am low on carbs and they had some great infusions. I also picked up a rub that I am going to use on dinner and will let you know more about it then and a habanero hot sauce. I also picked up a peppermill and some pink peppercorns. I made some modifications to dinner and my afternoon snack so that I can use some of the grape seed oil with my dinner frittata and now I can get back to using my nice stainless steel cookware! Still trying to decide on the garlic or the jalepeno infusion. So now that I am home let talk lunch. As you know I had to make some sacrifices to this meal so it was 1 can of tuna, 44g of butter lettuce with mustard and pepper for flavor. After that I had another yogurt for some sweetness. Its slightly holding me over but I am ready for dinner soon. I am going to start to push through with the help of some of the new teas that I picked up. I am fighting through this! Lunch time. Tuna, lettuce, mustard and a yogurt. Added some of my new pepper to this meal and Its was well worth it. As much I would like to have waited a little longer to eat this meal there was no way my stomach was going to let me. So it was time to put together my frittata. I combined some chicken that I rubbed in some Zulu Africa Mix spices from Oil and Vinegar (http://bellevuesquare.oilandvinegarusa.com/herbs-spices/dried-herbs/zulu-africa-mix-70g-2-47oz.html) cooked it for about 5 minutes, added 44g of whipped cream cheese, added 1/2TBSP of jalepeno grape seed oil, then added 244g of egg whites and cooked a bit on the stove top. I ground some pink peppercorn mix and salt on top and placed it under the broiler for 4 minutes but could have gone a little longer to really get a nice crisp on the bottom and sides but what can I say I was hungry! I have to say that this was the best tasting frittata that I have made yet with all of the flavors, but of coarse I would have loved more! With this as my introduction to pink peppercorns, the smokey flavor of the chicken, and the first experience with grape seed oil I have a lot of great meals in my future. One more meal and I am making Frotein! Gotta get that high volume meal before cardio and abs to hopefully give me something to power through because my legs are shot today and I have hockey tomorrow night then start the cardio grind right back up on Tuesday! If I had cooked it a bit longer it would have stayed together coming out of the pan better. Here is the seasoning behind the frittata that I used on the chicken. Finally a meal with some volume! I made some Frotein with True Nutrition Calcium Caseinate Cookie Dough flavor, Splenda, Xanthum Gum, 2 cups of almond milk and ice. Tossed everything in the KitchenAid then blended the ice and mixed it in with the rest. 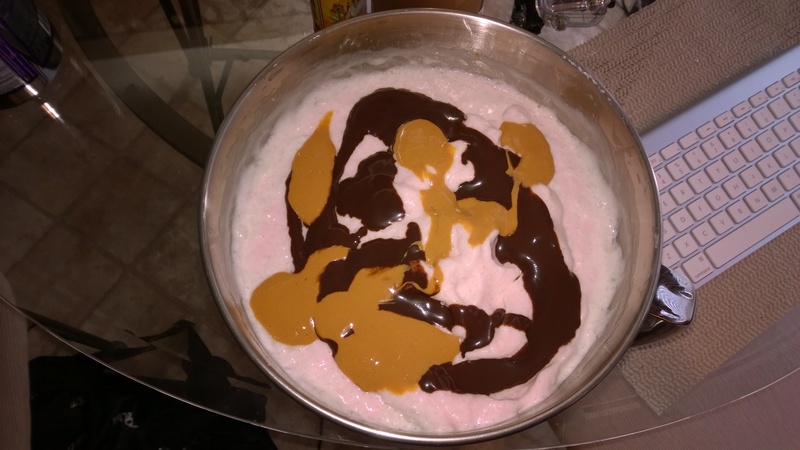 I mixed in some WF caramel and chocolate for a little more flavor. In all I think I did ok today on these low macros. Off to the gym to hit cardio and abs. My legs are so wiped out that I will be doing my cardio on the treadmill instead of the stairs today. Hope you all got something out of me telling you about how I got through this poverty day. Have a great week! Only 80 Carbs All Day! Fritatta it is! Sorry I haven’t posted in a few days I have been sick and trying to sleep it off. I was still training and hitting my macros but then getting home and trying to sleep off the cold. So today is a rest day and this Sunday my macro’s changed. I now only get 80 carbs on rest days! I thought to my self man this is going to be brutal, and well yeah its only 11:50am and its not easy but I am pushing through! I’ll do a full day of eating later tonight but wanted to post what is getting me through the day. Here is my Buffalo Tuna Frittata made with Lana’s Egg Whites! Definitely planning on doing a frittata video shortly since I have been making them a lot the past week. So easy! 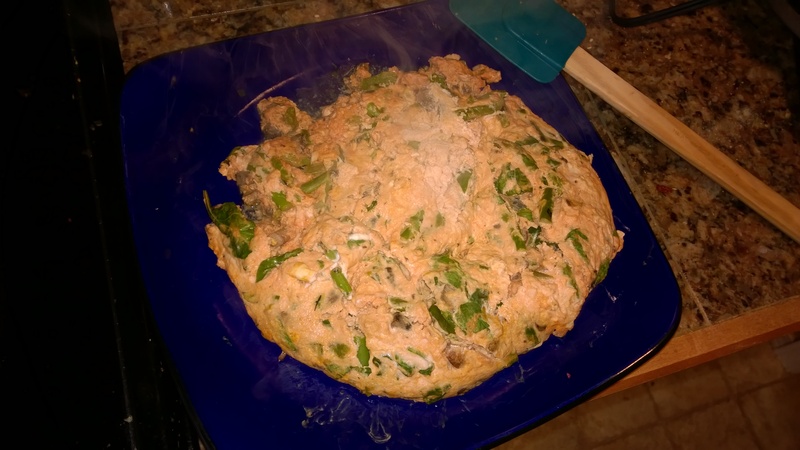 Tuna Frittata. It’s bigger than the picture makes it seem! So this is two serving! The whole thing is 18c/7f/79p) so about 9c/3.5f/39.5p of delicious volume eating! I soaked the tuna over night in the Franks and Buffalo tabasco over night to get the flavor. Cook up the tuna, mushrooms and asparagus till soft, add spinach and cream cheese and cook till the spinach is wilted, lower the heat and add the egg whites cook just slightly stirring frequently. Stick under the broiler for 4-5 minutes till cooked. Enjoy! You can substitute out shredded chicken or salmon or what ever for the tuna if you please! Wanted to atleast get a post up since its been a couple days. Look for more coming today got some crepes and other stuff coming!